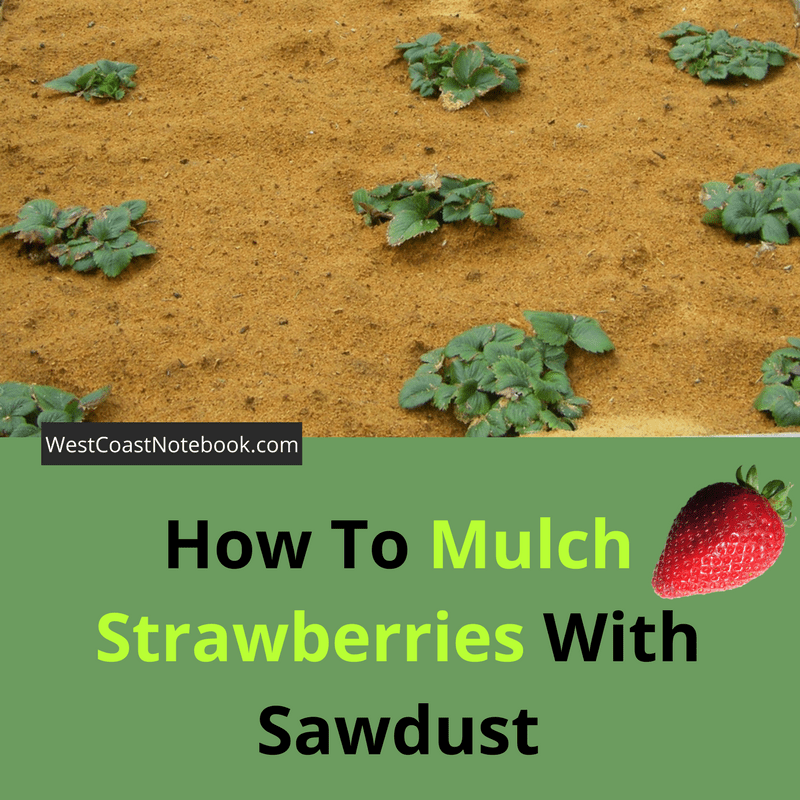 Can I Mulch Strawberries With Sawdust? / Can I Mulch Strawberries With Sawdust? Last year I planted a bed of strawberries that had a lot of weeds in it and I found that for most of the summer I was picking out weeds instead of strawberries. Mulch seemed to be the answer, but what kind of mulch. Back to Google and it appeared that straw was top of the totem pole. 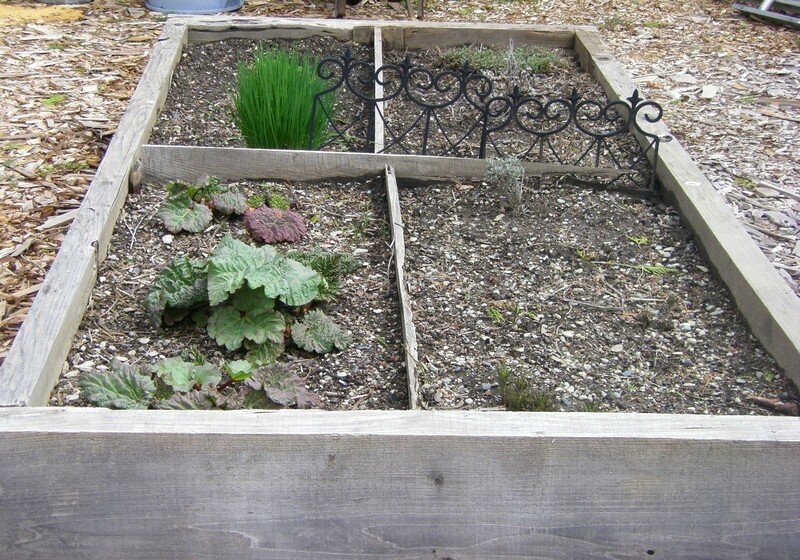 Which I agree is a wonderful option and I have used it before on my raised beds but along with it came the growing of oats, which I didn’t want. You just can’t seem to get clean straw with no seeds in it, so I’m back again to pulling weeds. This is still an option, but I’m looking for something better. What about leaves? First, let me say that I’m really glad I didn’t end up using leaves. I mulched my blueberries with maple leaves and now I have baby maples cropping up all over. Back to weeding. It didn’t look like leaves would be a good option for mulching strawberries either, so I searched again. I looked around the yard to see what was available that could be used as mulch and besides leaves there was sawdust. Sawdust because we have a Wood-Mizer sawmill for cutting lumber and beams and we are always looking for a use for the sawdust it produces. What was really interesting about searching on this issue was that I found an article that was written in 1952 about mulching with sawdust and the person who wrote about the method lived about 20 miles from me. Talk about local knowledge, right in my backyard. The article was entitled “Sawdust is My Slave” and it’s an interesting article on the subject. His article answered one of my pressing questions. 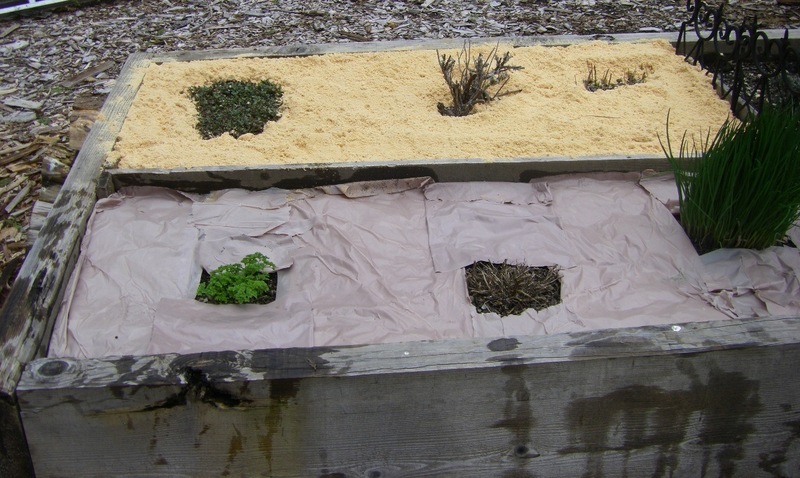 How to stop the sawdust from pulling all the nitrogen out of the soil. I wrote a post about having wood chips in my store bought soil and how my plants suffered that you can read here. 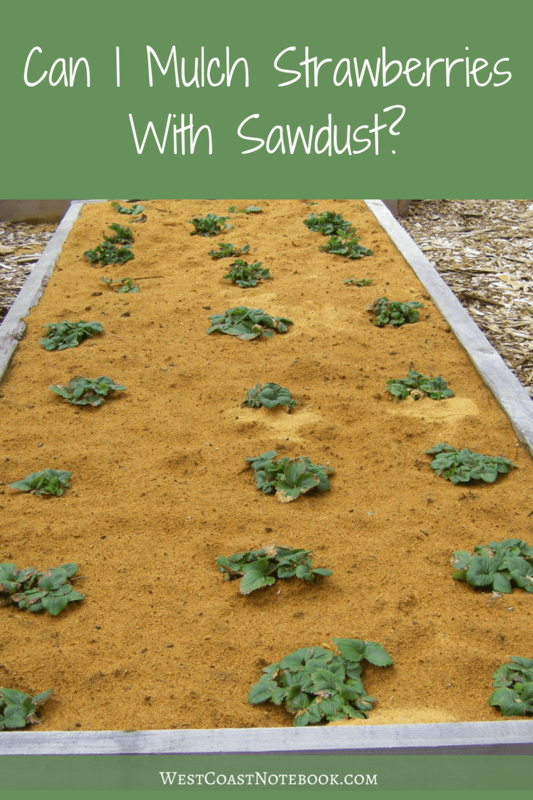 Here is an excerpt from the article “Sawdust is My Slave” that explains what happened when the soil got mixed in with the sawdust. For an example of nitrogen depletion, I had two beautiful rows of raspberries 6 feet high after being severely topped. These rows were mulched with sawdust and fed lavishly with poultry manure (which is especially high in nitrogen). I had allowed a forest of young canes to grow up between the rows, to sell for nursery stock. When it came to digging time in March I instructed the man who was to harvest them to pull them out instead of digging, which was the usual, method as I did not want to mix too much earth with the sawdust surfaces. I made the fatal mistake of not telling him the reason I wanted them pulled instead of dug. He started pulling them, broke a few off at ground level and being an intelligent Canadian with initiative picked up his shovel and dug the plants out. I discovered my mistake before he had started in the second row. By June, the row that been dug and in which the soil and sawdust were beautifully mixed in intimate contact was actually dying from starvation. The crop was lost, while on the adjoining rows, the berries were almost as large as loganberries. 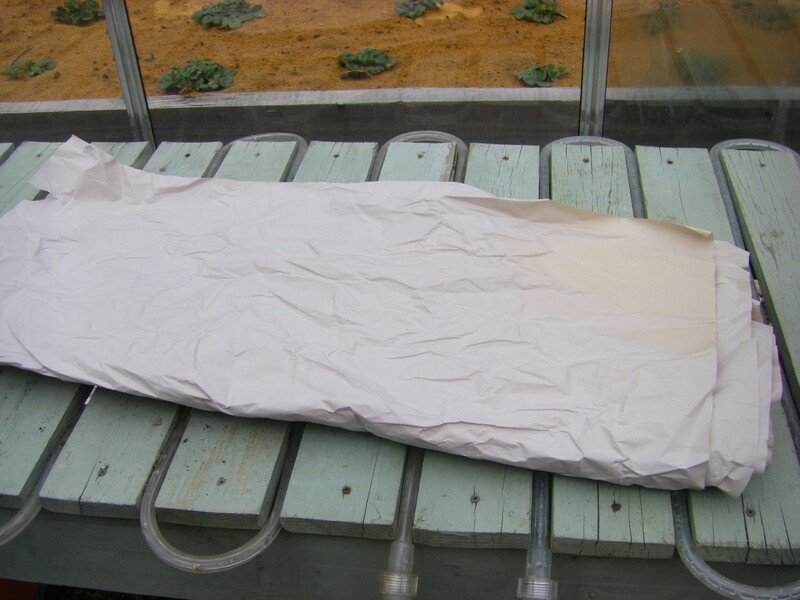 So, it could be used as a mulch, just don’t mix it with the soil otherwise, there will be a nitrogen deficiency. I was on a roll. But of course, I couldn’t leave it there. I got to thinking that maybe there was a way that one could put a barrier between the soil and the sawdust so that the sawdust could start to break down before it ever got to the soil. Thought about landscape cloth, but then the sawdust wouldn’t ever get to add it’s decaying nutrients to the soil, so I ruled that out. 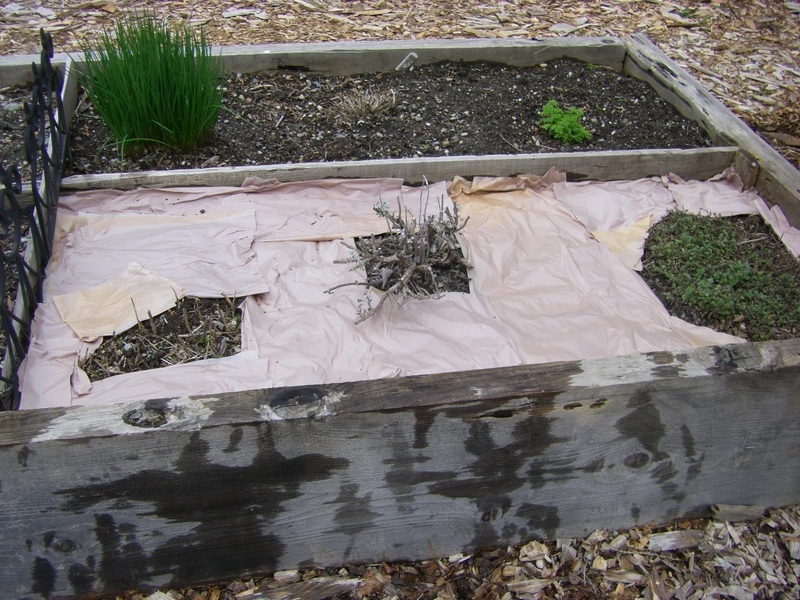 Then… I saw a video about a gardener who was creating new no-dig garden areas just by putting down newspaper on weeds and grass and then putting some mulch over it. The newspaper acted like a weed barrier and I thought that maybe it could act as a nitrogen barrier for me. I knew that putting a cover on the garden was beneficial as other years I’ve actually put cardboard on my raised beds completely covering them. In the spring, most of the cardboard is decomposed and what’s left is just pulled out and put into the compost. But the soil underneath is rich, black and full of worms and the plants love it. Taking the idea, I put it into action on my strawberries. Sorry… I finished them before I thought to take pictures of the process, but I did take some when I used the same idea on my herbs so you could get a sense of what I was talking about. The first thing I did was weed the beds and trimmed anything that needed trimming. Like taking the suckers off the strawberries and dividing the herbs into a more manageable size. Herb garden in March ready for mulching. The dividers are to keep the herbs from spreading. Instead of using newspaper, I had a bunch of packing paper. I put four sheets together and then either folded them in half or in thirds depending on the side of the row I was trying to fill. Paper folded in half. The rope lights underneath are to keep the seedlings warm. 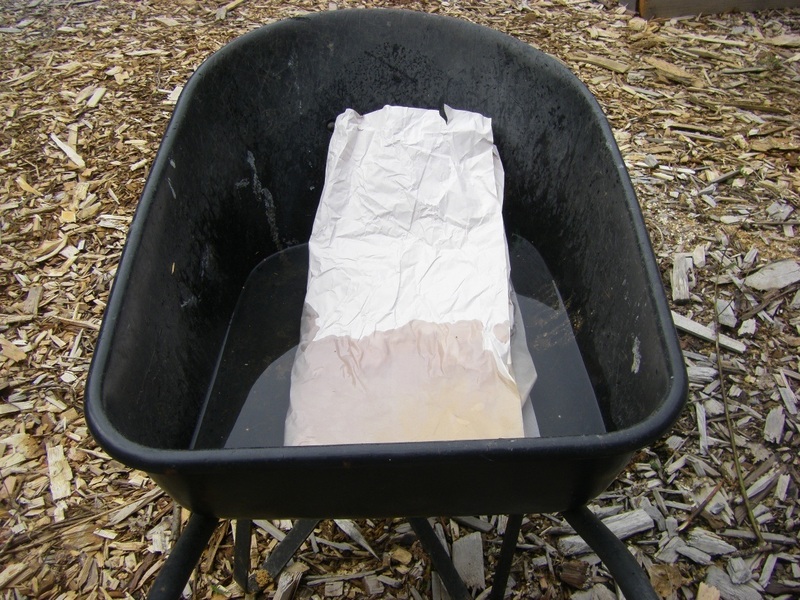 Then I put water into a wheelbarrow and I soaked the folded sheets and then started laying them out in the garden. It’s like putting together a jigsaw puzzle as you try and cover as much of the soil with the wet paper and just leave room around the plant. 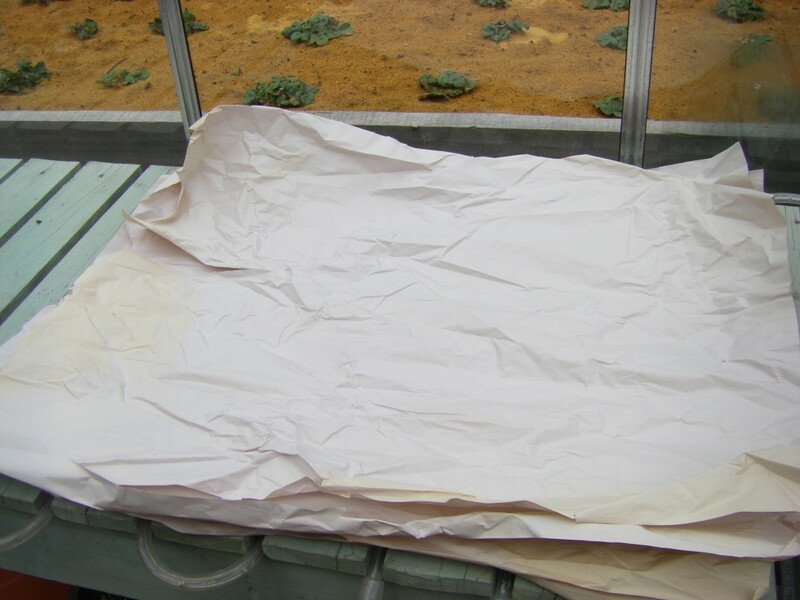 Cut, fold and fit the paper around the plants. Once that is done, then I just take sawdust and sprinkle it over the top 3-5 inches deep. Following the same process around the rest of the bed. I just further read an article that explains that is you have plants with long roots, wood chips will only take the nitrogen out of the top of the soil, but underneath the roots will still have plenty to utilise for growth. The one thing that everyone says is “don’t mix the soil and the woodchips or sawdust together. I will let you know how the experiment goes as the year progresses. Keeping my fingers crossed! The experiment went well and you can check out the results here.